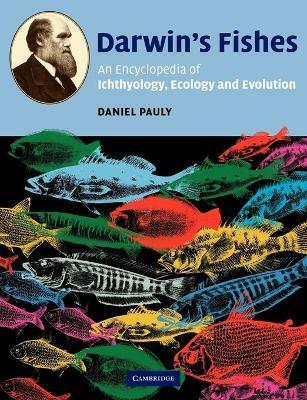 In Darwin's Fishes, Daniel Pauly presents an encyclopaedia of ichthyology, ecology and evolution, based upon everything that Charles Darwin ever wrote about fish. Entries are arranged alphabetically and can be about, for example, a particular fish taxon, an anatomical part, a chemical substance, a scientist, a place, or an evolutionary or ecological concept. The reader can start wherever they like and are then led by a series of cross-references on a fascinating voyage of interconnected entries, each indirectly or directly connected with original writings from Darwin himself. Along the way, the reader is offered interpretation of the historical material put in the context of both Darwin's time and that of contemporary biology and ecology. This book is intended for anyone interested in fishes, the work of Charles Darwin, evolutionary biology and ecology, and natural history in general. List of figures; Foreword J. S. Nelson; Preface and acknowledgements; Conventions used in the text; Darwin and ichthyology; Darwin's fishes: a dry run; Entries (A to ZZZ); Appendix I. Fish in spirits of wine Jacqueline McGlade; Appendix II. Fish of the Beagle in the BMNH; Appendix III. Checklist of fish specimens, identified as collected by Charles Darwin on the Beagle voyage, that ought to be present in the collections of the University Museum of Zoology, Cambridge Adrian Friday; Bibliography; Index to the fishes. 'This is an engaging book ... The reader can create his or her own stream of consciousness by following the asterisks or turning to literature citations ... an entertaining book with useful details ...' Trends in Ecology and Evolution '... wonderful fun to dip into, even randomly. It is an eclectic, scholarly reference work, rich in historical content and chock full of interesting quotes from Darwin and Pauly alike. Pauly has an engaging writing style and is not afraid to use humour and self-deprecation.' Nature 'Some books are good for browsing. Darwin's Fishes is designed expressly for it; and very pleasing and useful it is.' Institute of Biology 'Reading the book is like going on a fascinating journey of discovery about Darwin and his contempories, history of biology, evolution, fish biology and up to date biological knowledge. Every time you start reading, the journey will be different, there is always something new to discover ... Daniel Pauly succeeded in writing a fascinating, informative and very enjoyable book which is highly recommended to everyone interested in Darwin, fishes, evolution and biology in general.' PalArch, Netherlands Scientific Journal '... the potential readership is large: historians, ichthyologists, and students and scholars simply interested in natural history ...' Zeitschrift fur Fischkunde 'Darwin's Fishes is a remarkable addition to what is publicly known of Charles Darwin and his world, and a good deal else besides.' The Times Literary Supplement 'One of the book's great advantages is that it is crosslinked and self-referencing. ... It will appeal in particular to historians of biology, who understand the place fish have in the development of evolutionary ideas. Fishery and marine biologists will also have access to Darwin's work through the listing of single fish species, morphological terms, chemical substances, scientists, etc. Pauly has, with his publication, given an exciting and engaging portrayal of Darwin's publications and ideas. This approach deals not only with the ichthyological works of Darwin, but also demonstrates how important fish were to the development of the theory of evolution by natural selection.' History and Philosophy of the Life Sciences "...an engaging [and] entertaining book with useful details..."
Trends in Ecology and Evolution "[A]n eclectic, scholarly reference work, rich in historical content and chock full of interesting quotes and insights from Darwin and Pauly alike." Nature "Darwin's Fishes: An Encyclopedia of Ichthyology, Ecology, and Evolution, by Daniel Pauly, is a unique and insightful analysis of Charles Darwin's contributions to ichthyology and to evolutionary biology in general. I highly recommend this book as an enjoyable way to become reacquainted with the original writings and thoughts of Charles Darwin, and to perhaps appreciate for the first time his significant contributions to ichthyology." ECOSCIENCE, Randal J. Snyder "Provides a useful historic source." Daniel Pauly is a tenured Professor at the Fisheries Centre, University of British Columbia, Vancouver, Canada. He has written over 400 articles, books and papers.